Mercedes Ener-G-Force unveiled | What Car? 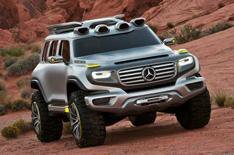 This the Mercedes-Benz Ener-G-Force, an SUV concept car that will make its debut at the 2012 Los Angeles motor show at the end of this month. The Ener-G-Force was created at Mercedes' design studio in Carlsbad, California. It's the manufacturer's entry to the Los Angeles Design Challenge 2012 a design competition with the theme of 'highway patrol vehicle 2025'. Mercedes says the Ener-G-Force was influenced by the G-Class, and there are echoes of it in the front grille, bonnet and side profile. The small glass area is designed to make the car a 'safe cocoon for law enforcement officers who are faced with many dangers', while emergency lights are integrated into the roof. Drive is by an electric motor, which is powered by hydrogen fuel cells. Roof-mounted tanks store recycled water, while the car's range is displayed by illuminated strips on the car's side sills. Although there are no plans for a production version of the Ener-G-Force, it hints at how a replacement for the next G-Class could look. Elements of it could also influence the next Mercedes ML and GL SUVs.